Valves are linear, with a slightly gibbous center and broadly rounded, slightly subcapitate apices. The axial area is linear and about one-third as wide as the valve. The central area is asymmetric and only a bit wider than the axial area. The surface of the valve of both axial and central areas are mottled. Outer fissure of the raphe is straight, while the inner fissure is curved forming a lateral raphe. The features of the raphe may be difficult to discern against the mottled surface of the valve. Proximal raphe ends are weakly expanded, deflected to one side, and closely spaced. Terminal raphe fissures are deflected to the primary valve side. The terminal raphe fissures are comma- or sickle-shaped. Striae are weakly radiate at the valve center and parallel throughout the rest of the valve. Krammer (2000) recognizes several varieties of P. acrosphaeria and the nominate variety is treated here. The varieties are described from outside continental North America: P. acrosphaeria var. sandvicensis A. Schmidt is described from Hawaii, P. acrosphaeria var. parma Krammer is described from Java and P. acrosphaeria var. tumidula Krammer is described from Germany. The specimens of P. acrosphaeria pictured on this web page are from a spring, a small lake, and a pond in western Montana. 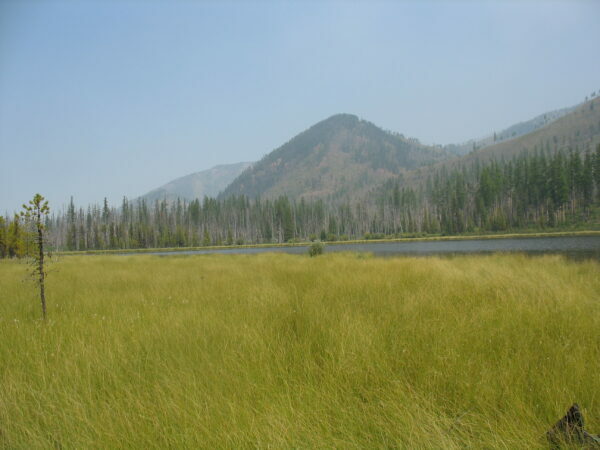 Kootenai Pond (photo below) has a pH of 7.78 and a specific conductance of 139 µS/cm. Krammer (2002) reports this species as mainly tropical in distribution, but also widespread in temperate regions of the northern hemisphere, where it is epipelic in waters with average electrolyte content and circumneutral pH. 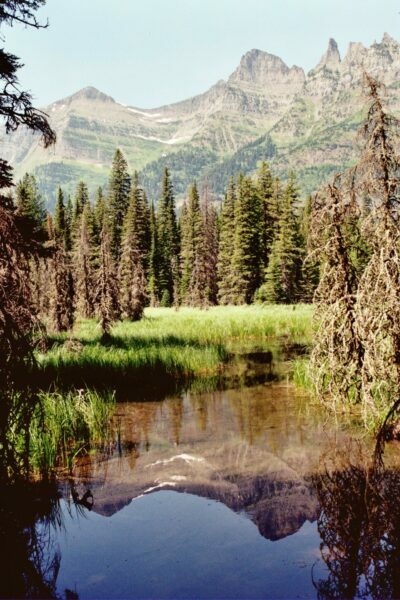 Mud Lake, Bob Marshall Wilderness, Flathead National Forest, Montana. Krammer, K. (1992) Die Gattung Pinnularia in Bayern Hoppea 52: 1-308. 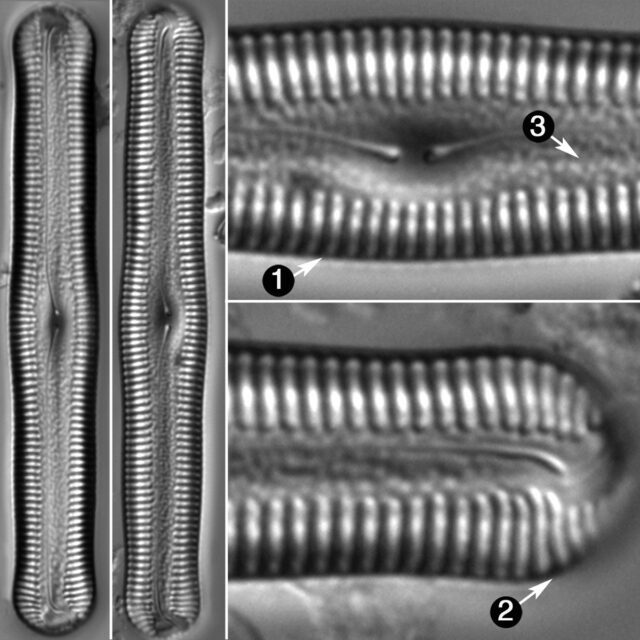 Pinnularia acrosphaeria has linear valves with an expanded center and broadly rounded, subcapitate apices. The raphe is lateral and the outer fissure of the raphe is straight. The valve surface has a mottled appearance.